Within the Master of Teaching Program at the University of Calgary, two teacher educators collaborated in facilitating an inquiry-based project with a group of preservice teachers in examining real-world issues related to English as Second Language students. A learning environment was created and modeled, where preservice teachers were challenged to think about teaching and learning with technology, the relationship between technology and learning, and to become designers of learning with digital media and network technologies. This article describes one teacher educator's perceptions of the project and presents her insights into planning and facilitating a learning environment that purposefully integrated technology to foster a rich, deep learning experience. Lock, J. (2007). Inquiry, Immigration and Integration: ICT in Pre-service Teacher Education. 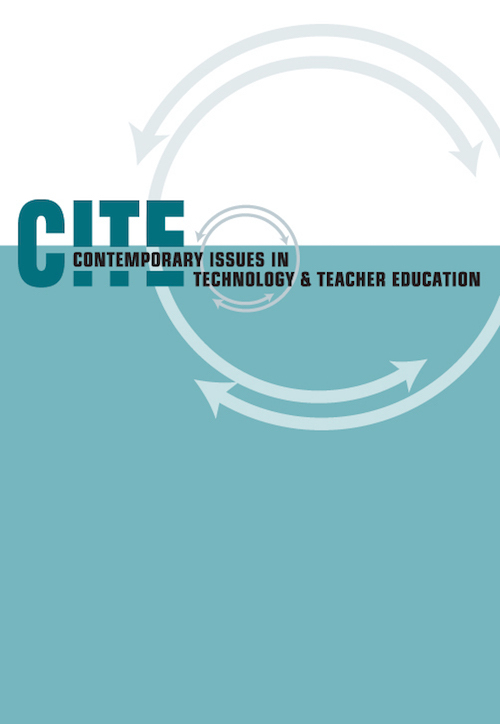 Contemporary Issues in Technology and Teacher Education, 7 (1), 575-589. Waynesville, NC USA: Society for Information Technology & Teacher Education. Retrieved April 26, 2019 from https://www.learntechlib.org/primary/p/21755/. Biesta, G.J.J., & Burbules, N.C. (2003). Pragmatism and educational research. Lanham, MD: Rowman & Littlefield Publishers, Inc.
Bitner, M., & Bitner, J. (2002). Integrating technology into the classroom: Eight keys to success. Journal of Technology and Teacher Education, 10(1), 95-100. Cochran-Smith, M., & Lytle, S.L. (2001). Beyond certainty: Taking an inquiry stance on practice. In A. Lieberman& L. Miller (Eds.) Teachers caught in the action: Professional development that matters (pp. 45-58). New York: Teachers College Press. Dawson, K. (2006). Teacher inquiry: A vehicle to merge prospective teachers’ experience and reflection during curriculum-based, technology-enhanced field experiences. Journal of Research on Technology in Education, 38(3), 265-292. Duhaney, D.C. (2001). Teacher education: Preparing teachers to integrate technology. International Journal of Instructional Media, 28(1), 23-30. Ellis, D. (2002). Parvana’s journey. Toronto, Ontario: Groundwood Books. Faculty of Education, Division of Teacher Preparation. (2004-2005). Handbook for the BEd master of teaching program: Year 1. Calgary, Alberta: University of Calgary. Filipovoc, Z. (1994). Zlata’s diary. New York: Penguin. Jacobsen, D.M., & Lock, J.V. (2004). Technology and teacher education for a knowledge era: Mentoring for student futures, not our past. Journal of Technology and Teacher Education, 12(1), 75-100. Levine, K. (2002). Hana’s suitcase. Toronto, Ontario: Second Story Press. Scardamalia, M., & Bereiter, C. (2003). Knowledge building. In G.W. Guthrie (Ed. ), Encyclopedia of education (2nd ed., pp. 1370-1373). New York: Macmillan Reference. Selber, S.A. (2004). Multiliteracies for a digital age. Carbondale, IL: Southern Illinois University Press. Slotte, V., & Tynjälä, P. (2005). Communication and collaborative learning at work: Views expressed on across-cultural e-learning course. International Journal on ELearning, 4(2), 191-207. Vanatta, R.A., & Beyerbach, B. (2000). Facilitating a constructivist vision of technology integration among education faculty and preservice teachers. Journal of Research on Computing in Education, 33(2), 132-149. Watts, M., Gould, G., & Alsop, S. (1997). Questions of understanding: Categorising pupils’ questions in science. School Science Review, 29(286), 57-63. Whitla, J. (2003). Ubiquitous learning: How technology is expanding learning opportunities in U.S. Homes, schools and communities. Mosaic, 5(3), 2-3.